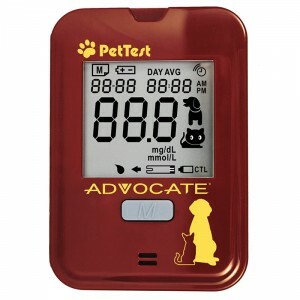 I was given a Pet Test Meter by Advocate to review. I’ve been using the Pet Test meter for a few months now. Over all, I am happy with the meter and recommend it as another glucose meter. The kit I was sent came with the meter, user manual, quick reference guide, 10 test strips, 2 AAA batteries, and a carrying case. The meter is slightly bigger than the AlphaTrak and iPet. The screen is large and easy to read. The meter feels solid and well constructed. There is a slot at the top of the meter for the test strips, a large screen, and a button. The case is pretty much the same as every other meter case I’ve seen. It has a place for the meter, the test strips, lancing device and a pocket for lancets. I like how the meter uses 2 AAA batteries. Yes, they take up more room but I like that I can use my rechargeable batteries instead of wasting button batteries. Setting the date/time was decently easy. Although I’m not fond of the button placement. There is button on the front and a button on the back behind the battery cover. You have to use both of these buttons to set the date/time and test modes, etc. A little weird, but as long as you aren’t switching between cat and dog test modes, you really don’t have to mess with the button behind the battery cover after the first setup. The strips are the same size as any test strip. One spot for blood. Upon putting a strip in the meter it will turn on and ask for a sample. You do have 2 minutes to provide a blood sample. Which is nice since some dogs don’t like to sit still. The amount of blood needed is really small, 0.3 microliters, which is the same as the AlphaTrak. Using the meter to actually test is to me slightly awkward. Although it isn’t much bigger than the other meters, the rectangle shape makes it feel big. Does it make taking a sample harder? No. Would I stop using it? No. Just a weird observation. Taking the sample and the results are quick. The results are clear and easy to read. I am happy to report that the results seem to be accurate. I compare against the Alpha Trak and here is a sample of what I got. 6:00pm after a 3.5 mile run, before dinner. The PetTest will show results from 20-600. Anything lower will display Lo, any thing higher will display Hi. When you press the M button on the front of the meter twice (once to turn on, then wait for it to ask for a strip, press again) the meter will also show 7, 14, 28 day average for both dog and cat and then individual results. The AlphaTrak 2 is $60 on Amazon. The test strips are around $45. $50 with shipping. Compared to the AlphaTrak 2 for $59. PetTest Control Solution for the PetTest is about $11-13 plus shipping. I am also glad to see the price of the meters are down $50 or more from last I bought mine a few years ago. I would recommend this meter. It is accurate and costs slightly less compared to the AlphaTrak 2. Having a diabetic dog, keeping cost down is important. Are you still using the Pettest glucose system? I have a cat that was just diagnosed with diabetes, and I think Pettest is cheaper on E-Bay and the strips and lancets are a bit cheaper. I think it’s best to ask someone who has been using pet glucometers rather than listen to manufacturers and sellers. I use both the PetTest and AlphaTrak 1. Both give similar accurate readings. However, I have not tested either on cats. I am so sorry; I just saw this message. I have been so busy with India. I bought the Pettest meter. I got my meter for less than $10 (Countryside was running a sale), and my strips for less than $40 from the same supplier. Right now, my cat is off the juice, but I still test to keep up with the numbers. India (my cat) seems to be letting me test her. It’s just getting use to testing and being able to trust the results. I use the control solution and the reading fell within the limits. However, do you know the difference between Level 1, and Level 2 control? Would it be too much to ask to email the answer if I forget to look at this page? It seems like level 1 vs level 2 is what number range the solution should be. So for example, Level 1 might read 100-120. Where as Level 2 might read 150-180. So you can check to make sure your meter is reading correctly at all ranges. But don’t quote me on that. Just started testing my cat today with PetTest. It reads 21.8, 18.1. What the heck is that???? My guess is your meter is set to display results in mmoI/L. The other unit of measurement is mg/dL, which is the more common unit of measurement and what most of the numbers will be on this site. I would consult your Vet on what is a normal range for a cat as I don’t have experience with diabetes in cats, just dogs. On what part of the dog do you get blood sample? I’ve been using the rim of the lip and he doesn’t seem to mind. But would like to check other sources as well. Blood is blood. If your dog is cool with you getting a sample from his lip, keep doing that. hi please I want to buy glucometer for pet which one is safe for me. This may sound silly, but how do I get the blood on the test strip after lancing his mouth? Deirdre: With the strip placed inside the meter, you place the end of the strip on the blood sample, the blood will seep into the little window, count down from 5, and give you a reading. Be sure when you are inserting the strip, that the word Pettest is facing up, and the square end goes into the meter. Jeff:Is your Pettest meter still working properly? I did a test with the control solution and it is giving a reading 213 (way outside the zone for level one solution). My strips do not expire until 2017, so I thought it may the control solution so I bought another bottle – the same issue. I have an email into the sellers, but do you have any idea as to what the issue may be? As far as I know, yes my PetTest meter works just fine. I did see a few reviews on Amazon where people were complaining their meter was bad. I would say contact Advocate. I would definitely recommend it since the strips are less than $19 w/free shipping for 50 on Amazon and the whole starter kit with 25 strips is less than $18 w/free shipping on Amazon. For the person asking about the 21.8 and 18.1 results, there are two possible measurements, mmoI/L and mg/dL. You can set the meter up to display in either measurement, you just need to go through the set up again by taking the back of the battery cover off and using the setup button to adjust the measurement. Mg/dl is customary for the U.S., the other measurements i seen more in Canada and other countries. I have used the meter for my dog now for 6 months and only had an issue after I dropped the meter, then it started giving inaccurate results because I compared it to my backup (WAY more expensive for strips) Alpha Trak2. I called Advocate customer service and they sent me a new meter and start up kit with 25 strips for free. I use the Alpha Trak2 a couple times a week to make sure they are both giving similar results. Can you silence the beep when you put the strip in? I’m currently using One-Touch meter and test strips designed for people. Do I need a pet meter, too? @pamelapeet: I think you can, check the settings there should be a way to turn sound off. @Darla: Using human meters will not give you accurate results. Our blood is different from dogs blood. No human meter I have tried has given accurate results when testing Bender. Today i took my dogs gloucous with the pet test and it read 341. I had a check up appointment with my vet today and when i told her about the results she tested my dog with her kit. The vet’s test read that my dog had a low gloucous while the tester read high. I have the setting on for dogs, but all of my results were inaccurate. While the vet’s gloucous test read normal at between 100 and 125, my pet test meter read 200 – 300 gloucous level. This meter has been inaccurate since i have gotten it. Have you tried their control solution to make sure your meter is correct/incorrect? I’ve seen some issues with their meter from other people online. I would suggest contacting Advocate. We struggled terribly when it came to pricking our dog with the lancets. He would cry when we used his ears as the test site and started hiding from us when he saw the ADVOCATE meter in hand. What I REALLY want to share is that our vet suggested shaving a small patch on his backside right at the base of the tail. HE DOESN’T EVEN SEEM TO FEEL IT, which was a huge relief for all of us. 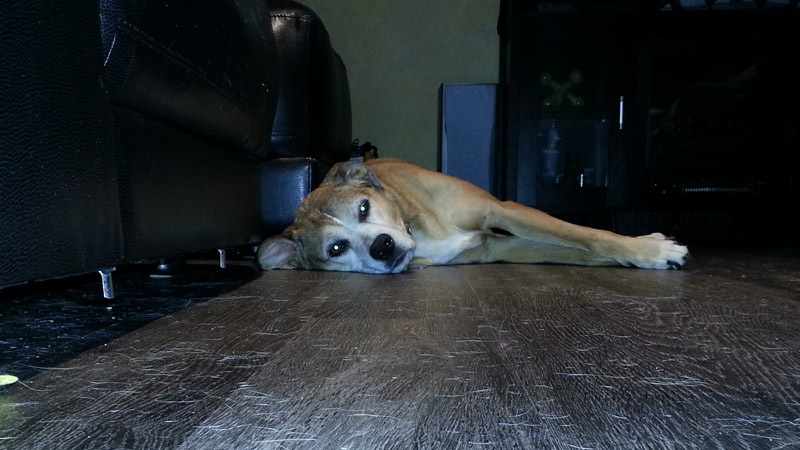 Our vet said that so long as we use that spot consistently, it will give us reliable glucose levels. I urge anyone having trouble with the ‘pricking’ process to try it. It made all the difference in the world! It’s hardly even noticeable. Are there different sized lancets? The 21G are short and don’t draw blood. Or am I doing something wrong? There are different size lancets. The larger the number the thicker the lancet blade. If you have an adjustable lancing device, you might not have it set high enough and/or you might not be lacing in the right spot. I lance on Bender’s inner top lip. Some people do feet. Ears are pretty difficult. UltiCare VetRx Ulti-Smooth Lancets, 26-Gague. They work really well. Has anyone tried the FastaCare meter?? I can’t find any reviews on it. my control test reading was 333. Did it twice. What gives? Tried to get a sample from the dog’s ear, she tried to bite me. Walmart has pet test strips for the Advocate .. 50 strips for 5.37 https://www.walmart.com/ip/PetTest-Test-Strips-50-Count/154893754 … really good price. I use my dogs elbow callouses .. she has one on each front leg .. and it works really well. I DO NOT use the lancets they are terrible and they hurt… I use an insulin needle, very small and VERY sharp and she doesn’t even flinch. You barely have to poke and you get blood and with the needle the prick stops bleeding fast but not with the lancets it takes longer.